If you have been hanging around the internet you have probably heard about Thrive Market. They do a lot of advertising, including ones on this very site. In case you haven’t heard, Thrive Market is an organic and healthy food delivery business. 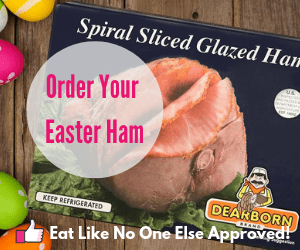 Their line of products are similar to what you would expect to find at stores like Whole Foods Market. You may have been tempted to try it out, but scared off by a $59 yearly membership fee. 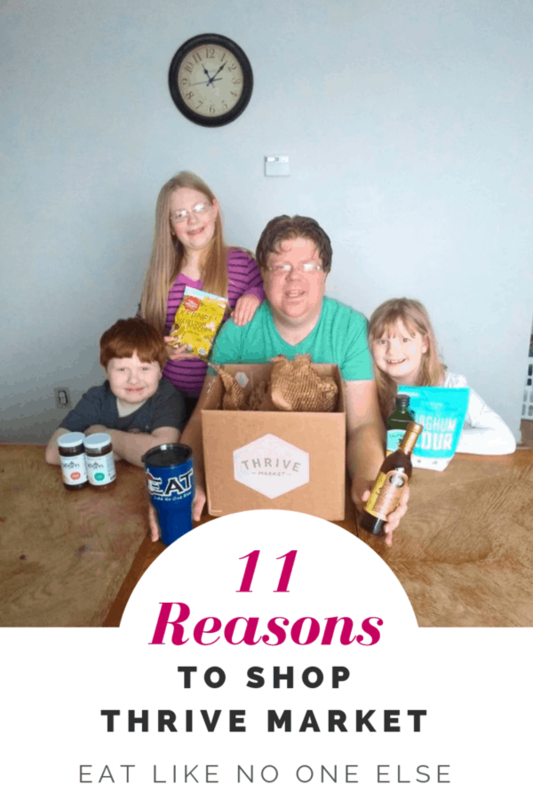 Today’s post is going to give some justification to becoming a Thrive Market member with 9 reasons to shop Thrive Market. Below you will find 9 Reasons to Shop at Thrive Market. I will break down each reason below. 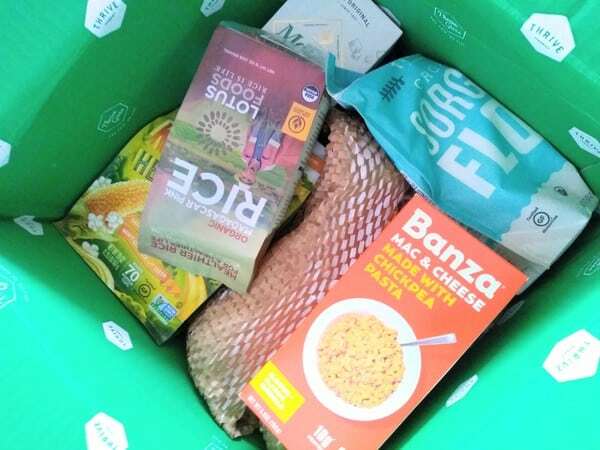 Inside the box of my first ever Thrive Market order. Everything was packed very well, better than what most cashiers do at the grocery store. I want to tell you about my first order. 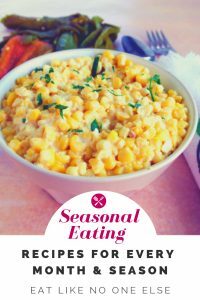 I have heard a lot of great things about Thrive Market, especially from other bloggers, so I have been looking forward to trying them out. Last week, I made my first order. I did have to wait an extra day for it to arrive because of an ice storm. However I made my order on Monday afternoon and it would have been here Wednesday if not for the ice. That is right up there with the speed of Amazon. I have heard 2-3 days seem to be the average delivery time, based on how far you are from their distribution centers. Everything arrived in great shape. No damaged or missing items. 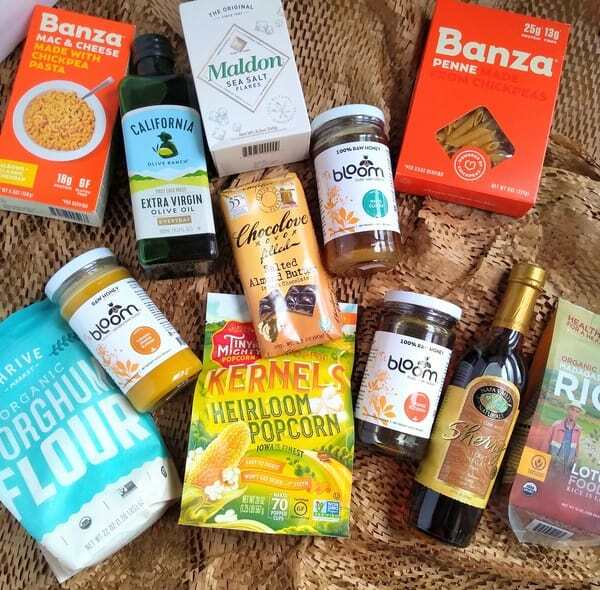 Here are all the items I got in my first ever Thrive Market shipment. Here is everything I ordered and the cost at Thrive Market that I paid. I also compare the price it would cost to get the same quantity from Amazon. That is pretty good considered I have a jar of Extra Virgin Olive oil, and 3 jars of raw honey among my 12 items. You can also see that many of the items are not available on Amazon, have a higher pricce, or you must buy in bulk. So you can see, if you were wondering if you can just get all this stuff on Amazon the answer is no. Now let’s get into those reasons I talked about. Thrive Market as their own brand of products they offer like the Sorgum flour you see in the blug bag. Sometimes your location can be tricky. To my blog readers who are having trouble finding ingredients I mention, this is your moment! Thrive Market is great for those that live in a rural location. Many people that live rurally don’t have access to many of the products available on Thrive Market. The grocery stores they do have nearby don’t carry much in the way of organic, higher quality products. Those that live in urban areas that have stores like Fresh Market, Whole Foods, etc, don’t have problem finding ingredients, but in rural America it’s a lot harder to come by. You may only have one grocery store nearby and it doesn’t carry a lot of organic or natural foods. And what is available is way overpriced. Thrive Market can be a life changer especially for that segment of the population. Now on the opposite end of the spectrum, maybe you live in a really urban area, where traveling around by car is the biggest challenge. Maybe you walk and carry with you most of your groceries. Thrive Market can help cut down on the load. With items shipped directly to you , you won’t have to carry as much from the grocery store. From raw honey, extra virgin olive oil, to stone ground flours, and the list goes on. Thrive Market has the ingredients to help your food thrive whether in taste or in nutrition. 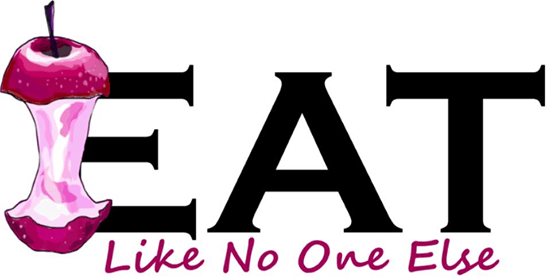 I always say when you start with better ingredients, you end with better tasting food. Bloom Raw Honey, California Olive Ranch Extra Virgin Olive Oil, and Napa Valley Sherry Vinegar are all pantry stables that I will use to make food taste better and be healthier. Chocolove is my favorite chocolate company. I had not tried out their Chocolate Filled with Salted Almond Butter yet. Chocolate. Come on. That is reason enough. 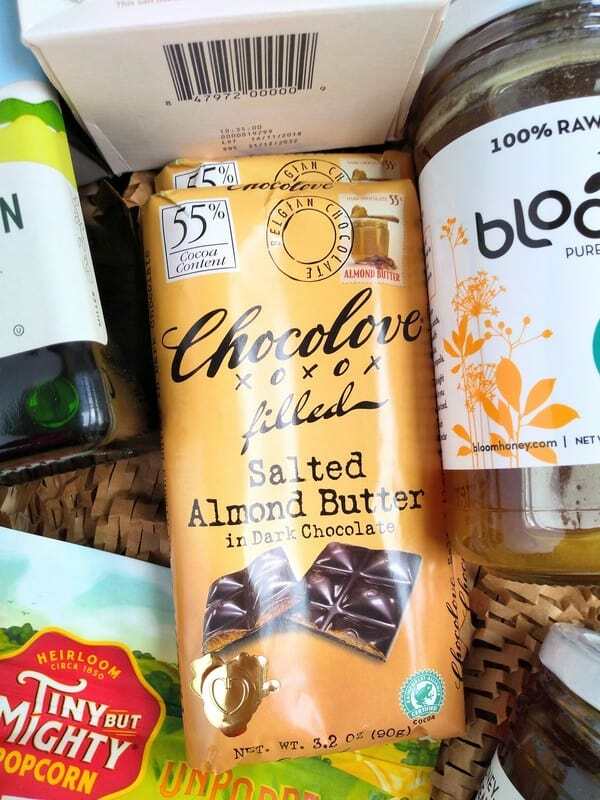 Thrive Market offers a great variety of premium chocolate including my favorite brand Chocolove. I love the snap of their chocolate and that the price isn’t as high as some of the other premium bars. They have hit that sweet spot. Don’t neglect to try their delicious Dark Chocolate Hazelnut Butter cups. Thrive Market also sells chocolate from Divine, theo, Tony’s Chocolonely to name a few. Thrive Market markets their own brand of organic, Paelo chocolate bars. You don’t even have to pay for a membership. If someone gave you a coupon for 25% off of a Costco order and you didn’t have a membership, do you think you would use that? I know I certainly would, so thrive market giving the offer is no different. Thrive Market offers free shipping once you are over the $49 mark. Considering that the majority of my grocery bills at checkout are over $49 I have no trouble hitting this mark. The downside if you need something small and that’s all you will still have to pay a shipping cost. That is where it pays to plan ahead. Do you have a store that you do the majority of your grocery shopping at? Maybe there are a few items you need to pick up elsewhere, like a place like Whole Foods and that’s really all you buy there. Thrive Market can save you from making the extra trip, by using their services instead. Stock up on those items for the month to save on shipping. And if you aren’t making an extra trip there you can save on gas and depending on your drive that might be worth the cost of the membership over the whole year. The only thing we like more than free shipping is free gifts. 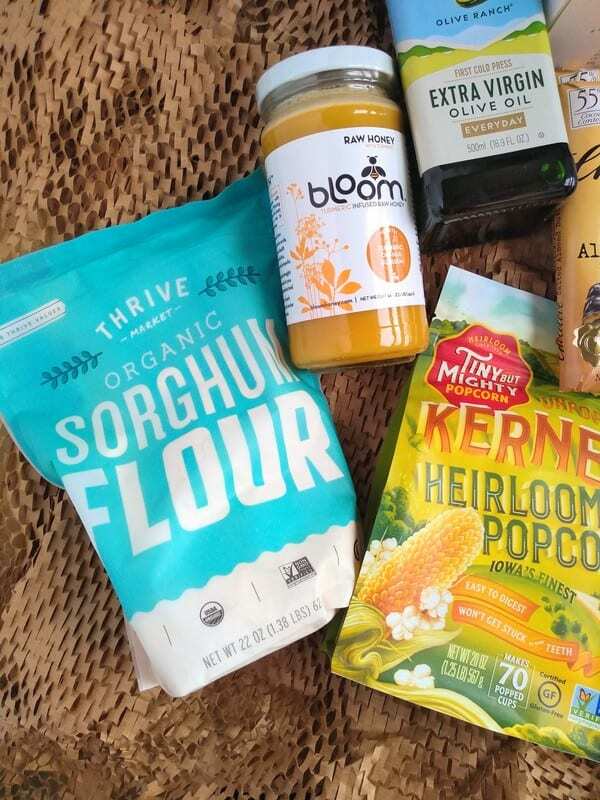 Thrive Market regularly will send emails offering free items with your purchase. It’s a great chance to try something out that you might not have otherwise. An example of free gifts included recently 2 bags of Angel Hair Wonder Shirataki Noodles and a jar of Thrive Market Organic Marinara Sauce. That’s a free dinner. If you have children and can’t even make it to the store without bringing them along, you probably don’t have the time you need to browse the shelves and see what’s there. You need to get in and get out to keep your sanity. Ordering from thrive Market allows you to take the time to search out next products to try that you may not have spotted in a store before because you were too distracted by your kids punching each other. Last summer we did a series called Hit the Road Snackin’ on healthier snacks for a road trip. Thrive Market would be a great source for the snacks. Justin’s Almond Butter, Joival crackers & cookies, Chocolove chocolate, and I Heart Keenwah Quinoa Puffs. Order the for the trip and save time having to run to the store for snacks when you’re also packing. You can find nuts, chips, jerky, better for you sweets, and more. If you follow a gluten free diet, Thrive Market may be your new best friend. They have a lot of gluten free options from alternate flours to crackers, tortillas, etc. If you are a gluten free baker you should be able to find whether you need. Thrive Market carries Bob’s Red Mill products, which offer a lot of what you need for gluten free baking. Great for tracking down that hard to find gluten free ingredient. If you have any questions about Thrive Market, please leave them in the comment s section below.